I’m trying to get more practiced utilizing Dropbox. This is relevant to posting, because part of what serves an excuse for not posting more often is the lack of pictures I can throw into my posts. It feels…wrong to lack pictures, not because I’m trying to get my SEO so so right, but–I suppose–because I recognize that pictures seem to be expected. I’m striving to improve on that particular failing. So the last time I posted it was a stressed, semi-sleep-deprived screed about how much I hate basing. At the time I was facing down a target of having 500 fully-painted and based points on the table for the tournament, something I’d never accomplished before. With the assistance of my wife, who is an exceptional painter willing to hop in and help particularly because having tasks made the experience less stressful for her than painting her own stuff (though pics to follow of that because I’m so very proud), I managed to hit the target. I admit, too, that I’m really happy (even now, two months later) with the results! 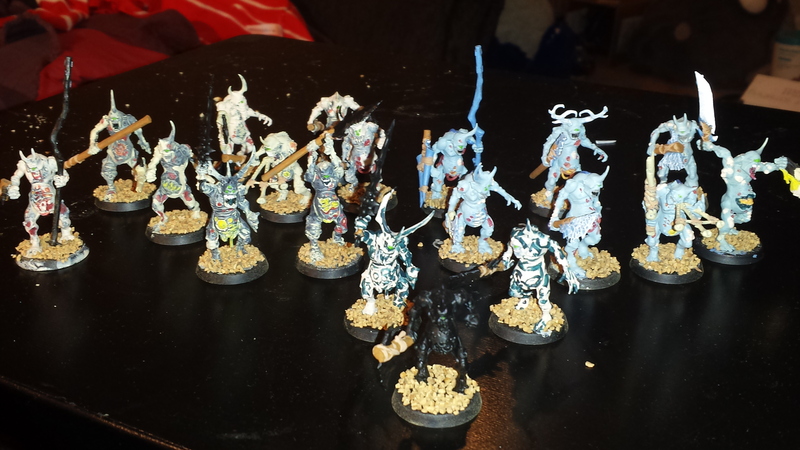 The Plaguebearers were perhaps the third set of models I painted for a proper army. I’d played with painting some figures while waiting for my Reaper kickstarter to come in, but never with any aim towards real cohesion. I decided I wanted to paint them up as though they’d died of frostbite, which required spending a couple days looking at pictures of frostbite. I would eventually add in some frozen plaguebearers and a few weird ones, mostly because I got bored of painting everything the same way–and I love how the wet black paint looks on a model. At the time, I didn’t really understand what a wash did. I had washes, and I’d read about how to use them, but I didn’t fully understand A) their function and B) how one makes them at home. 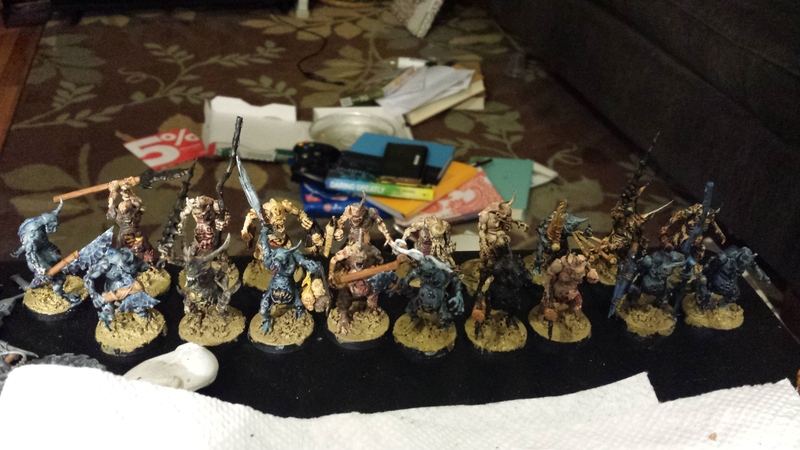 Having never heard of medium, I watered my paints down and applied them to the entire models. This actually ended up having a desired effect, a bit of a happy accident I’m looking forward to revisiting: the frostbitten models, which were primed black then “washed” with a flesh tone, actually do look like their flesh has necrotized and started flaking off. I went in and lovingly colored all the weeping sores on the models with a variety of colors, and was very pleased with my effects. What a difference some texture paint (plus understanding how washes work) makes! Boom! The blue wash on the frozen ones gives them excellent depth, though at some point I ought to go back and highlight them and perhaps throw some white down on the top surfaces to suggest snow. My fleshy Plaguebearers don’t feel as frostbitten now, but definitely look nasty on the table. This was some of the first–and most hurried–work I’d ever done with texture paints, so at some point I’ll drybrush the top of the bases to get a snow look. I’ve also since found this excellent tutorial, so as I swell Nurgle’s ranks (if I stay with this scheme) I’ll be able to approach things a bit more intentionally. Still, I’m a convert. I still don’t like basing, just like I grumble at washing and highlighting and multiple coats, but it’s nice having visual evidence that they look considerably better when I take the time. This surely needs some Blood for the Blood God, but I hadn’t played much with that at the time. I’ll leave off with a picture of my bloodletter Icon Bearer, which was a model I let myself have some fun with right before the tournament, when it was clear that with Stacey’s help we were going to make our goal. I think he looks cool enough to almost compensate for how maddeningly top-heavy he is, even with a base weighted on the under and topsides. For the bloodletters we went with a somewhat kludgey but still thematically appropriate approach, in part owing to my having already crudely smeared greenstuff over their bases back when I first made them. We painted the hilly greenstuff with leadbelcher, and the exposed base with some red and orange to create a magma effect, as though the bloodletters stride across chunks of slag floating in molten metal. Sidenote: Entirely to my surprise, I tied (with a man whose profession is art) for best painted in the tourney! I also scored points for having a pointed army, but…and this’ll be the subject of another post…painting points and a victory don’t counter being matched against back-to-back Dark Angel Devastators and Tau gunlines. Posted in Painting, Tournament, Warhammer.Tagged Gryphon Games Cheyenne, Painting, Tournament, Warhammer 40k. Congrats on the painting prize! Well-deserved–love the look of those plague bearers. Thanks very kindly! It’s both an inspiration to get cracking on my Chaos Marines and a sad trombone on the part where I picked an almost entirely featureless paint scheme for them on purpose, as I’m representing The Cleaved as existing in that place beyond sensation, where eyesight goes white and your ears hear nothing but a dull buzz. So they’re…white-ish, with some chrome. But I’m having ridiculous fun with Beastmen and that’s before playing with the whole concept of unit fillers. That’ll get basing back in too!